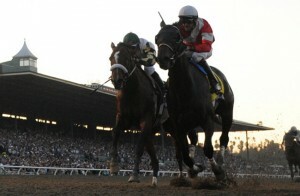 This weekend we are going Toe-To-Toe handicapping Santa Anita. We are going to look at four races including the Santa Anita California Flag Handicap which is a race for 3 year-olds and up for $100,000 going 6 ½ F on the downhill course. 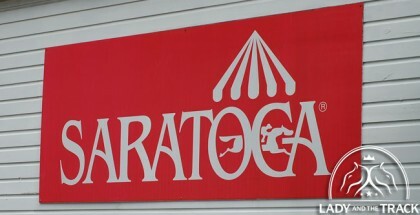 We are each going to pick our top horses for races 2-5 with a few plays. With the upcoming Breeders’ Cup Challenge Races in two weeks, Sigi and I decided to concentrate on the races for the next two weekends that take place at “The Great Race Place”. Santa Anita is both Sigi and I’s favorite track and we figured we’d get a leg-up on seeing how the track plays and how the trainers and jockeys are doing during this meet. Last weekend we handicapped the Queen Elizabeth II race at Keeneland. I have to say I was really impressed by Crown Queen and her run. Not only did she bobble a little after the slow break but she fought off Ball Dancing in the stretch for an incredible win. She was my top pick to win as well as one of Sigi’s top three. My second pick Sea Queen lead the whole way and gave it up in the stretch to finish 6th. My third pick Personal Diary finished in a deadheat with Sistas Stroll who was Sigis top pick. Sistas Stroll ran a fantastic race breaking last and coming with a vengeance from the back of the pack. She is definitely one to watch moving forward. Sigi’s second choice was Ball Dancing, who gave Crown Queen everything she had but was denied in the stretch. She should move forward quite well in her next race and is also one to keep an eye on. Sigi’s top three picks all hit the board, so he is on a roll again! We were happy we nailed the top four horses that finished, even though neither of our plays won. That’s how it goes sometimes. Onward and upward. I’m going with #5 Heir Of Storm here dropping in class. Last out was 7th behind Indianapolis & Diamond Bachelor at SA going 6 1/2 f on dirt. Has one of the fastest dirt speeds in this group and should improve going shorter for Miller with Baze up and blinkers off. I also like Carla Gaines #4 Finallygotabently who is newly gelded. Should improve switching back to dirt, drops in class and has some nice works. Probably kick myself but going with #4 Boozer here. Hasn’t been off the board in 7 starts, won last out going 1 1/16 on the lawn at Del Mar so we’ll see if he can string two together with Bejarano up again. I am going with another Carla Gaines entry here #2 Super Ability who is cutting back to a sprint and has shown some nice works over the lawn, should appreciate this distance. Trying to beat #5 Red Outlaw who is the undefeated boy but I can’t seem to leave him off a ticket. He won by just a head in the Baffle in February so we’ll see if one of these can school him down the hill. There is not a lot of fast girls in this race so I’ll take a flyer with the #1 Gem Of a Gal for Art Sherman. This Tiz Wonderful girl doesn’t have the best speed figures, but who cares. She drops in class today, adds blinkers and has already run a mile on this course, finishing 6th last out. *note she did bobble at the start. Sold. I also like #4 Watdifrenzdzitmake, a Papa Clem filly who has never routed but her sire had a winner Wednesday at Santa Anita with Niassa, so well see what she brings to the table. I think she’ll relish more ground, has shown improvement and tosses the blinkers. I’m digging the #2 Bourne Hot who was trained by O’Neill and we know where that went, so Leandro Mora has the title. Dropping in class, high percentage with this trainer turf to dirt. This barn was on fire last weekend and he should improve with the cutback. The #4 Industry Leader is running second off the claim for Pender from the Kristen Mulhall barn. Ran second last out dirting a 6f, drops in class and should improve here with some solid works. Taking a risk with jockey Kyla Stra and #9 Beau Maverick from sire Leroidesanimaux. This boy has only won one race in 28. I’m giving him a shot. He’s dropping in class, should improve from turf to dirt and trainer Dunham as a decent turf to dirt record of 20%. Bring it on Beau & Kyla at a big price. My Samurai Warrior has been facing tough horses lately and he looks fit in the mornings. If the pace turns hot, he will come from the clouds and should win this race. Elvis Trujillo stays in the irons, and that’s a sign of confidence. Heir of Storm is the speed of the speed, he has a good post position and will try to wire the field. 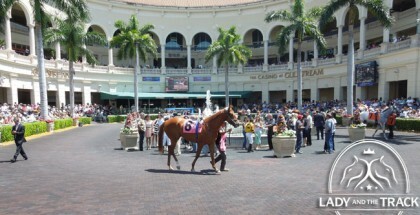 Red Outlaw is the logical choice since he is unbeaten and looked impressive in his last victory in El Cajon Stakes. The only race he ran in the downhill he won by a just a head, so I’m trying to beat him with Super Ability, a horse who loves the grass, and his workouts indicate he’s in the best form of his life, also he will appreciate the distance. Watdifrenzdzitmake improved a lot in her last race; now she’s dropping in class and looks like she’s screaming for more distance. This is a modest field, and with a clean trip and a bit of luck the filly with unpronounceable name should win this race. I’m using her as a single. Industry Leader is dropping in class again, it is know his best times are past, but this is a weak field and he faced tougher fields. Znelle moves up in class, but he broke like a rocket in his last, and never looked back, if he repeat that effort, has a good shot. Ballard Ruler is returning from a long layoff (more than a year) with solid workouts, and it seems all his issues are have been overcome. If he runs like he works there’s no race, but we must respect the layoff. Good luck to everyone and hope you hit this weekend at the track. Safe run to everyone and thanks Sigi for adding your picks and plays. Hope we have a few “Winner, Winner, Chicken Dinner” runners in here.